Have you taken time to see the beauty around you today? Haha! You posted while I was reading through your other posts and commenting. So happy you're doing another Joy List this week! Such a cheerful, joyful post of red, red, red! (I wonder about that upstairs door on the farmhouse!). I caught the most beautiful sunrise this morning! Wishing you a wonderful week! 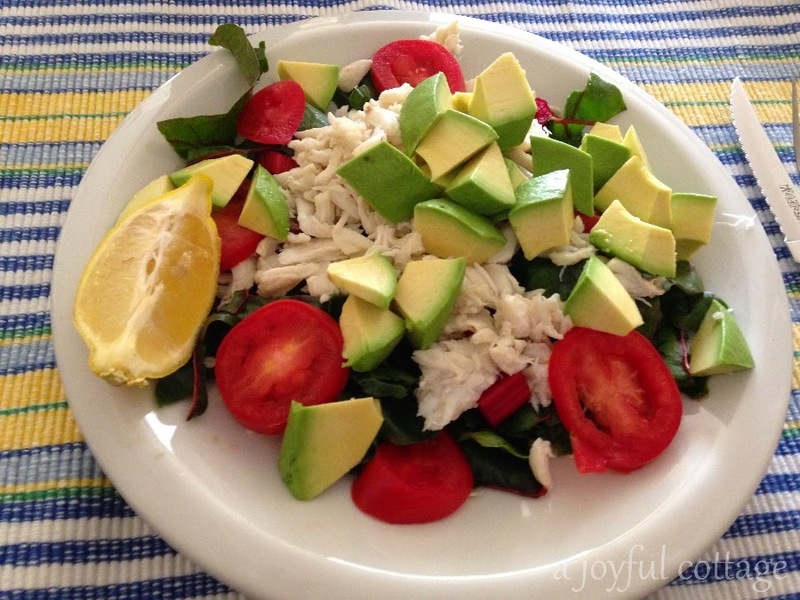 Great list, and the salad looks delicious! Yes, the sun is out today and I went for a neighborhood walk, I so enjoy being out in nature, and see God everywhere in the beauty that surrounds us. Hope you have a good week! Your lunch salad looks YUMMY. Now onto the merits of the magical color of Red. Gives warmth, energy while it excites and feeds the soul. I adore Red, can you tell you hit a hot button? I am with you ... love red. It's so bold, so bright, so cheerful. Nice post. I did not know you quilted. How did I miss that! Today I had a pair of cardinals at the feeders and in the branches of my lilac tree. They are gorgeous against the white snow. I had to scroll back to see the upstairs door :) it would be gorgeous painted red too. I LoVe most reds and brown/reds. Hope you are having a wonderful week. Red is a real pick-me-up for me. I love it in all the traditional ways, with white and blue and yellow - but I also love the red and green of Christmas and even red and purple together on a scarf. It gives a bit of a zing to a room too. 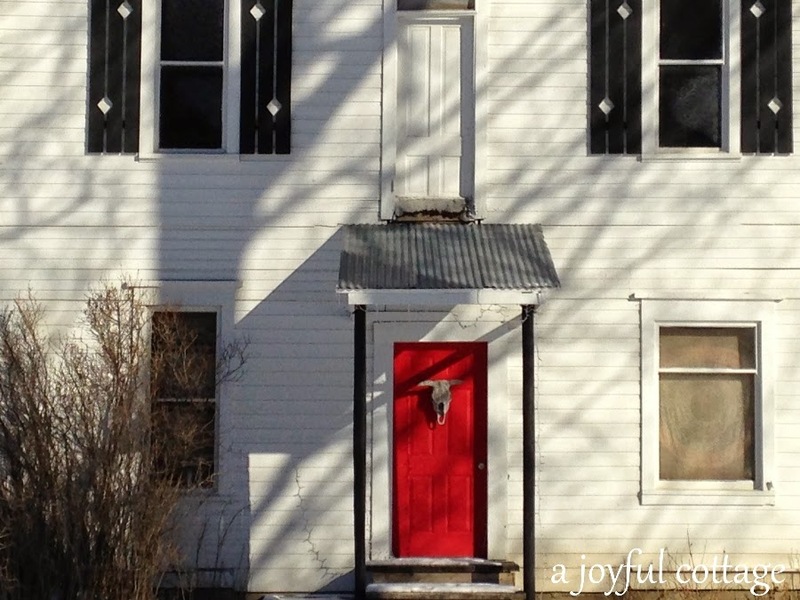 I love the red door...so pretty and uplifting. Your quilt is just gorgeous....what a talent!! Love that red door, skull, not so much . . .
Red certainly is a "pick up color, isn't it! Two blogs back to back . . . all about red! Good morning Nancy! I just woke up and now I can enjoy my quiet moments here in Blogland, a place I love. I love that red door! And that salad you made...yum! What a cheery (or should I say cherry) way to start the day. 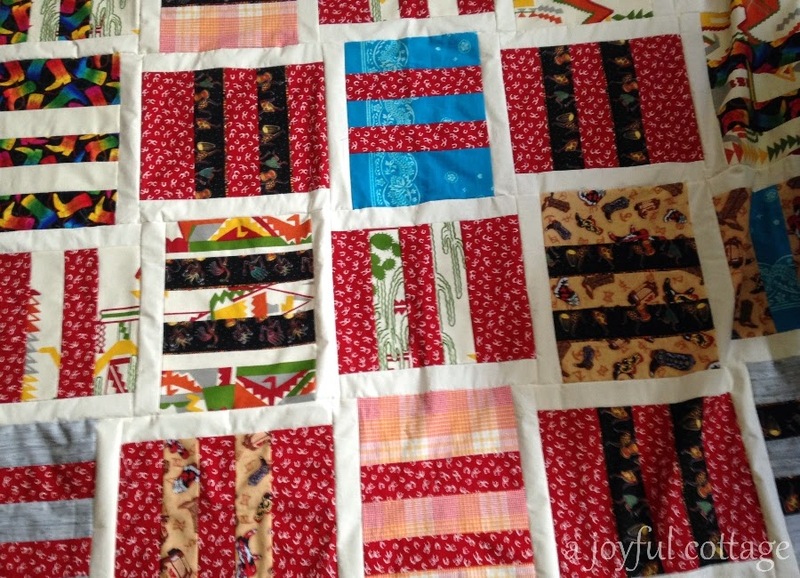 Love the scrap quilt, what's the pattern? I was feeling down this morning until I read your post and saw all the red. You reminded me that I have much to be greatful for even in my loss. Thank you. I love that red door and the quilt looks wonderful! Love the photo with the red door. I am inspired to make a salad now. Your salad looks just wonderful. We love salad! I love those beautiful red leaves! Mine are nearly gone and I am going to miss their bright and cheery color. I love the Bible quote, beautiful! Thanks, Gigi.I love that verse. 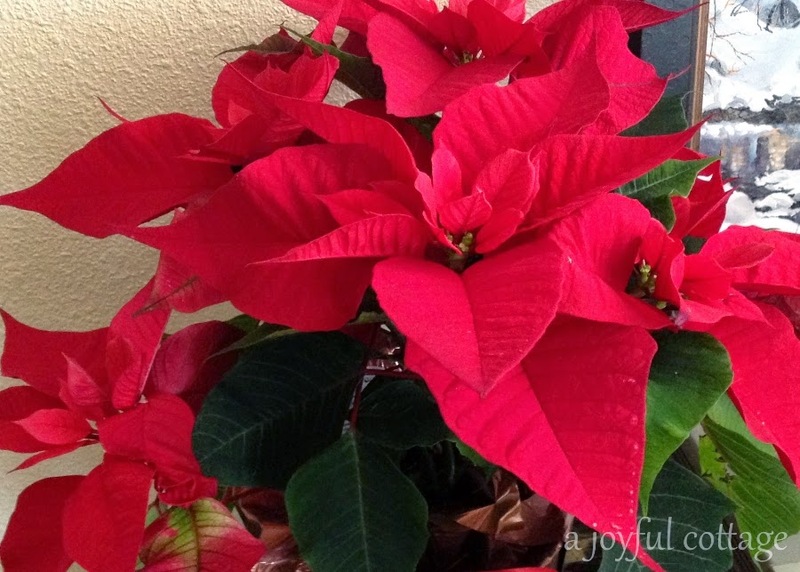 We're pretty fortunate, we buy at least one poinsettia every Christmas and they always last a long time -- often way into February. So fun to be "seeing red"
I love the red photos! So very inspirational to get out there and create! :) Thanks for sharing with us on the Art of Home-Making Mondays! Lots of joy! Love that farmhouse with the red door and that salad, oh yum1 Your quilt is beautiful and there's nothing like flowers to brighten a Winter day!! Thanks for sharing with SYC.